Warren Buffett Predicting Dow One Million - Being Bold Or Overly Cautious? In a recent speech, Warren Buffett came down boldly on the side of optimism when it comes to both the economy and financial markets. What he said was "being short America has been a loser's game... And it will continue to be a loser's game." And to throw down the gauntlet against some the current negative talk in the markets, Mr. Buffett boldly predicted something quite extraordinary - which was that in 100 years "the Dow will be over a million." Is that even remotely believable, or is Mr. Buffett getting carried away by his own optimism? Warren Buffett knew as he predicted Dow One Million that this would seem unbelievable to many people or even ridiculous. Which is why he also said this "is not a ridiculous forecast at all if you do the math". In this analysis we will do that math using two key assumptions. First we will use an absolutely average historical rate of inflation. We will also take a look at the Dow Jones Industrial Average in the same terms that Mr. Buffett was talking about - which is price changes in an index (but not including dividends). In the process we're going to learn some valuable lessons with a great deal of real-world applicability not just going out 100 years, but also for the next 10, 20 and 30 years when it comes to retirement financial planning and other forms of long-term investment. We will begin by determining the long-term rate of inflation. For this we will go back to 1933 and the end of the gold standard for domestic purposes. The consumer price index for urban consumers, which is usually referred to as the CPI-U, was 13.2 in August of 1933. Exactly 84 years later in August of 2017, the CPI-U was up to 245.5. Now there's several different ways of looking at this. One way is what would have cost us $13.20 in 1933, instead costs over $245 dollars in 2017, meaning that we are paying almost 19 times as much for the basic goods and services of daily life in 2017 than we did in 1933. 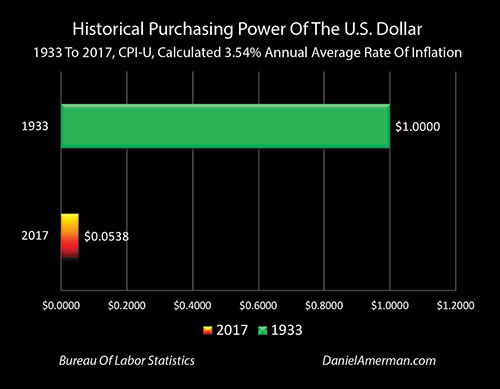 Another way of looking at this is as shown above, which is to say that the purchasing power of the dollar has dropped from one dollar in 1933 to a little over five cents in 2017. And when we do the math, dropping from a dollar to little over 5 cents in 84 years works out to an average annual rate of inflation of 3.54%. 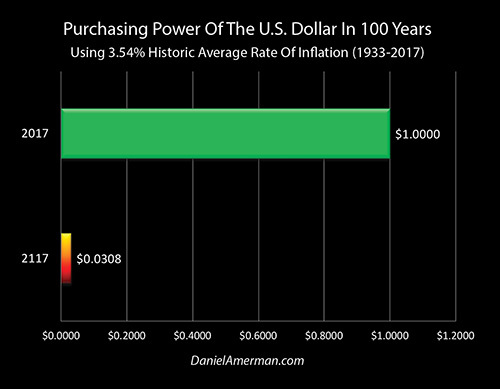 If we take that same exact rate of inflation of 3.54% and project it forward for 100 years - to match Mr. Buffett's prediction - then we expect that the dollar will have a purchasing power of a little over three cents. This is a good bit lower than the reduction to five cents that we experienced between 1933 and 2017, but we're going out 100 years instead of 84 years and that makes a big difference. No one can say for sure, but if we accept that a good source for a guess at the long-term future is to assume that the long-term past repeats itself (which is quite questionable, but that is the norm in finance and economics) then a purchasing power for the dollar of a little over three cents in the year 2117 could be called a reasonable guesstimate. So if we start with Dow 1,000,000 and we adjust for historically average inflation, then Dow $1,000,000 would have a purchasing power in today's terms of Dow's $30,845. (The index is not actually expressed in dollar terms, but it will be easier to follow in the examples herein if we use dollars in certain places - as if someone were literally spending $22,413 to buy the Dow index). As of September 20th, 2017, the close in the Dow was 22,413. So that would then imply that we have total real profits adjusting for inflation of only $8,432 over 100 years ($30,845 - $22,413 = $8,432). That is only a 38 percent profit in real terms - in what our money would buy for us - over an entire century. How can that possibly be? The startling answer can be seen in the graph above which breaks Dow 1,000,000 in 100 years out into its individual components. The first thing that we see is the thin orange slice of 22,413 which is the starting value for the Dow Jones Industrial Average. The yellow slice which is even thinner still is the 8,432 which represents 100 years of real inflation-adjusted profits. The entire rest of the pie graph, the entire remaining amount of Dow 1,000,000 is 969,155 in inflation. It's the dollar going from being worth a dollar to dollar being worth three cents (1,000,000 X (1 - .0308) = 969,155). So Mr. Buffett predicting Dow 1,000,000 in 100 years is not in any way a remarkable and fantastic leap of optimism. He was right to say to check the math and once we do check the math - we can see that this is not an aggressive forecast at all. Indeed if we experience historically average rates of inflation in the future, then Dow 1,000,000 in 100 years is a remarkably cautious prediction, and could even be called a very pessimistic prediction. It means that for the entire next century there would be hardly any real profits in the entire stock market in inflation-adjusted terms. 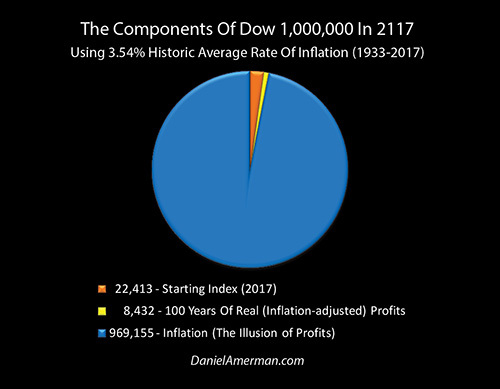 When we run the numbers, for the Dow to go from 22,413 up to an inflation-adjusted 30,845 in 100 years would mean a 0.32% real (inflation-adjusted) rate of return on an annual basis, or a return of just over 3/10 of 1%. And the source of confusion here, for how what is actually a very pessimistic projection can be seen as ridiculously optimistic - is that few people really take into account what an average rate of inflation does over time. Mr. Buffett gets that math, but he also knows that most don't. Dow One Million and the pie graph above may seem outlandish or exaggerated, but all it really shows is what happens if the completely normal just continues to repeat itself - over a long enough period of time. If we stick with this seemingly bold or even ridiculous projection of Dow 1,000,000 and examine what's really involved in it - we have the ability to learn something else as well about investing over the long term that most investors simply aren't taking into account. The move from Dow 22,413 to Dow 1,000,000 will obviously generate a fantastic amount of profits. So long as we look at a dollar being a dollar, and we don't adjust for inflation, almost all of Dow 1,000,000 in that case is pure profit. Now what we need to keep in mind is that that is exactly how the Internal Revenue Service views the world. All they see is profits. They don't generally do any adjustments for inflation. So in getting to Dow 1,000,000 - we are likely to owe a great deal of taxes. To calculate how much in taxes we owe, we subtract our original investment (our basis) from the sale price. And if we subtract Dow 22,413 from Dow 1,000,000 that means that we have 977,587 in taxable income. Looking at the components of taxable income above we can see that of that we are going to owe taxes on $8,432 in genuine gains, as can be seen with that very narrow little yellow slice. 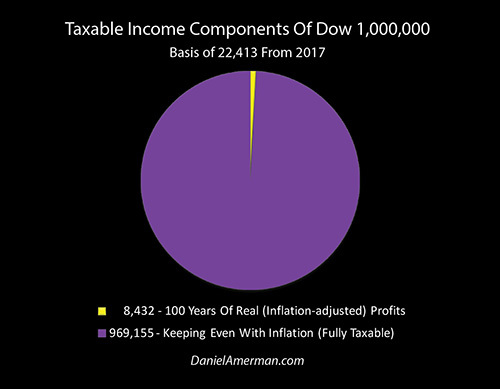 But on an equal basis we will also owe taxes in full on the gains that only reflect keeping up with inflation, which is the purple area that makes up the overwhelming amount of that graph. So we owe taxes on an additional $969,155 of what is effectively illusory income. As explored in the analysis linked here real tax rates can be much higher than most people have any idea. The Federal Reserve creates annual inflation as a matter of policy. And we've seen the effect of this over the past 84 years with a 95 percent reduction in the purchasing power of the dollar. Keeping up with inflation means that almost 19 dollars is needed today for every dollar that we started with, and that means we have to pay taxes on almost 18 dollars of illusory profits that are really just keeping up with inflation. Because one branch of government, the Internal Revenue Service, does not recognize what another branch of the government, the Federal Reserve, is doing as a matter of policy, this means that a deliberate "vise" of sorts is created that most people are not aware of, which squeezes our financial results and can create real tax rates on investments that can be much higher than people think they are. Nobody knows what tax rates will be 100 years from now. However, for example's sake, we will say that a 25 percent long-term capital gains tax rate is a reasonable round number assumption. If we use that assumption, then 25% of our $977,587 in taxable gains is $244,397. So we take selling the Dow for $1,000,000, we subtract $244,397 in taxes, and we're left with after-tax proceeds of $755,603. But we have to adjust that for inflation. So when we take into account the $0.0308 purchasing power of the dollar in 2117, then the after-tax purchasing power of Dow 1,000,000 is $23,307 ($755,603 X .0308 = $23,307). That's a gain of only $894 on our investment of $22,413 over a full century of investing. 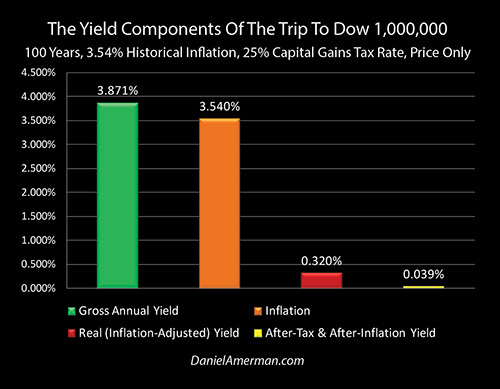 The true annual after-tax and after-inflation yield of Dow 1,000,000 in 100 years is 0.0391%, or a return of less than 4/100 of 1% per year. As it turns out our previous belief that we could earn $8,432 in inflation-adjusted returns and an annual return of 0.32% from the Dow reaching 1,000,000 in 100 years turns out to be wildly optimistic when we properly take into account how the Internal Revenue Service treats the inflation that is created by the Federal Reserve. To better understand the journey from Dow 22,413 to Dow 1,000,000 let's take a look at what's actually happening in yield terms rather than dollar terms. To go from Dow 22,413 to Dow 1,000,000 in 100 years requires a 3.871% gross annual yield as shown in the green bar above. If we look at average inflation repeating itself, then 3.54% of that would be inflation, which is the orange bar and is by far the largest component of the gross annual yield. When we look at our real inflation-adjusted yield, which is the red bar, it is a tiny fraction of the green and orange bars, and only amounts to a 0.32% annual yield. But when we take into account paying taxes in full on the orange bar of inflation, all we're left with is a 0.039% annual yield, which is less than four one hundredths of one percent. Another way of looking at this is that if we compare the height of the red and yellow bars, then what is supposed to be a 25 percent tax rate according to the Internal Revenue Service, instead turns out to be an 88 percent tax rate (0.039 / 0.32 = 12%). Drawing a lesson from a 100 year projection of our round number Dow 1,000,000 might seem a little bit theoretical. And of course it is. That said, this is a very good way not just to learn about a possible future, but to also learn from our collective past. Because what we have just covered here is indeed a key part of crucial years in our past - which could also have a great deal of applicability for the future. As explored in the analysis linked here we can find some quite similar real-world situations that have recently occurred in our past. Between 1997 and 2012 it looks like the Standard & Poor's 500 rose by almost 50 percent, which we can see with the blue bar. But even with relatively low inflation during that time and over a period of not 100 years - but only 15 years – still, virtually the entire gains were inflation as can be seen with the red bar. 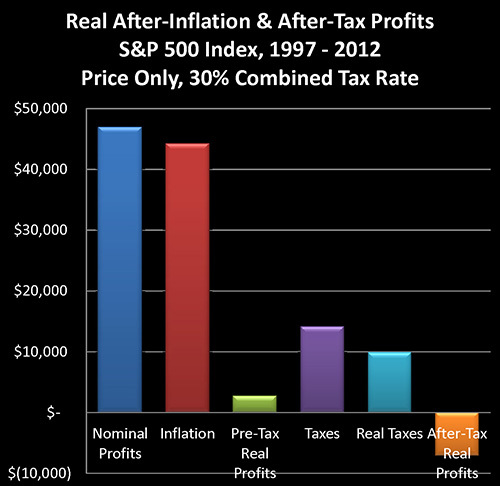 So our real (inflation-adjusted) pre-tax profits are only what we see in the green bar. Yet, we have to pay taxes in full on the red bar so our taxes are far larger than our actual profits, whether we look at in nominal terms (the purple bar) or inflation-adjusted terms (the light blue bar). And when we fully take taxes into account with the orange bar on the right, we actually had a negative rate of return. 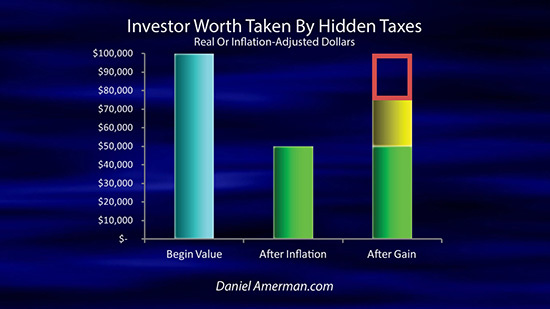 The IRS ignoring what the Federal Reserve did in creating inflation, turned what appeared to be a 50%+ positive return into a negative inflation-adjusted return in this real-world example. The IRS and the Federal Reserve each understand what they are quite intentionally doing - but how many average investors fully understand the playing field that the government has set up? Understanding this can be critical when it comes to maintaining net worth - and hopefully increasing net worth - not just in nominal, or even after-inflation terms, but much more importantly what really matters, which is after-inflation and after-tax terms. So, did we just explore a potential future catastrophe? Despite what he said about optimism – does Warren Buffett turn out to be a pessimist after all? There's a couple things that we need to keep in mind to be fair here. The first one is that Mr. Buffett did not say that the Dow would be exactly equal to 1,000,000 in 100 years, but that it would be over 1,000,000. So we could say to that the Dow could be 2 million or 4 million at that time, which with the same inflation assumptions would produce much higher yields on both a pre-tax and after-tax basis. There is another key component here which is that while much of the general public focuses on the level of the Dow index, professional investors are very well aware that over the long term it is the payment of cash dividends and the compounding of those cash dividends within portfolios that can be one of the most important components of wealth. So the good news is that if we add in dividends at a current yield of about 1.89% on the S&P 500, that would radically increase the results that we're looking at in terms of after-inflation and after-tax yield. The bad news is that this dividend level is currently still close to historic lows. So if 1) all we get is Dow 1,000,000 in 100 years, which is very low as one source of income, which is price gains; and 2) we also continue to receive the other source of income at the current quite historically low levels, which is dividends, that would in combination imply 3) long-term results that are far less than what we have experienced in past decades. When Warren Buffett made his bold prediction of Dow One Million and challenged skeptics to do the math (as we've done herein) he had two major advantages over most people. The first advantage is that Mr. Buffett has been around for a long time, he is 87 years old. And the second major advantage is that for many decades Mr. Buffett has understood financial mathematics to an extent that most people don't. So when Warren Buffett was predicting Dow 1,000,000, all he was really doing was taking the life that he has lived and saying what if this happens again – only a much more conservative basis. The graphic above is very similar to our 100 year projection except in this case we will take a look at what Warren Buffett has lived since he was a small child in 1933 (when the United States went off the domestic gold standard) until 2017. And we will take a look at the September 2017 Dow in 1933 dollars. We begin with the orange slice that can barely be seen and that is Dow 99 which was the starting value of the Dow in August of 1933. We will add to that the much larger yellow bar of 1,106 which is 84 years of real (inflation-adjusted) profits in 1933 dollars. Those are major profits! But nonetheless, the overwhelming majority of today's Dow is the blue area of the 21,208. Even looking at an extraordinary time period of wealth creation for the U.S. economy and stock markets, when we go to a sufficiently long time period - almost 95% of the apparent wealth creation turns out to be just historically normal inflation, i.e. the results of the Fed slowly destroying the value of the dollar as a matter of policy. Because he has lived this time period - fully understanding what has been going on around him for most of that time - Mr. Buffett has a really good idea of what has happened and just how completely non-ridiculous it is, indeed how conservative it is, for the Dow to reach 1,000,000 in 100 years. If we look back and forth between the initial pie graph of Dow 1,000,000, and the graph of what Mr. Buffett has lived, there's a very big difference, which is the relative sizes of the orange areas of starting investment, and the yellow areas of what is real profits. So this raises the question of where will we be in 100 years if both inflation and the real growth in the Dow were to just repeat themselves such as Mr. Buffett has experienced in his lifetime? We start with our orange slice of 22,413 (or we would if we could see it). But nonetheless, we still have a hundred years of historically average inflation, and the dollar still only worth a little over three cents by 2117. So even with these far higher real returns, the overwhelming majority of the pie, 97 percent of our graph, has to be the blue 12.5 million of inflation that is the illusion of profits. Whether we are looking 84 years back into the past, or projecting 100 years in the future – what we see either way is an extraordinary amount of blue in those graphs. Inflation dominates everything, given enough time. This is true to an extent that let me suggest the average person simply has no idea. This also becomes critically important as we look at the much shorter time periods that are involved with making long term plans for retirement or other long term financial planning. The effect is not as dramatic as if we were going out for a century, but it is still far more powerful than most people realize. And this can be of critical importance for financial planning, particularly given our current situation of having approximately a $20 trillion total national debt. Now something that has been well understood since Mr. Buffett was a small child – and long before then – is that heavily indebted nations which control the value of their own currencies, deal with large national debts by at least somewhat increasing the rate of inflation. When people think about very large national debts they may think of disaster scenarios, such as future defaults or hyperinflation. Those can happen, but they aren't required, particularly when it comes to nations with powerful economies, such as the United States. As developed in one of the first row analyses in the analysis matrix linked here, a more historically typical way of dealing with large national debts over time is a moderate increase in the rate of inflation. Even a moderate increase in inflation is enough to drastically increase the amount of blue in the pie graphs, and to further overwhelm real profits with illusory (but taxable) "profits". Looking to the shorter term of 10 years, 20 years and 30 years out, a relatively mild increase in the rate of inflation is still enough to change the entire financial world – and our personal standard of living along with it. Indeed, as developed in detail in the second row analysis linked here, there's a case to be made that the higher inflation associated with having a $20 trillion dollar national debt is going to be directly leading to substantial reductions in the average standard of living in retirement - even without including the impacts of likely low interest rates or potentially lower benefits. 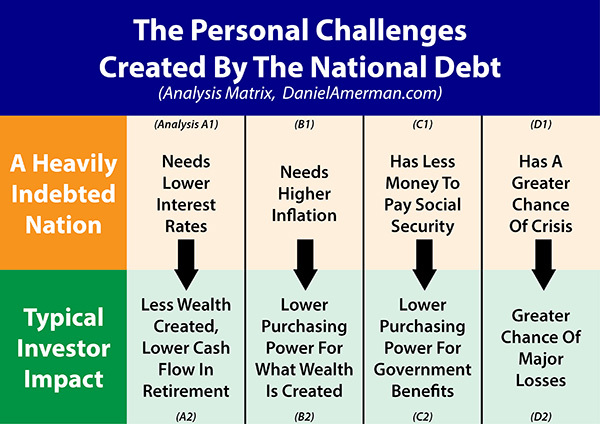 The mathematics are quite similar to what is shown here, there is a direct connection between the nation and our personal outcomes, and there is a power to this connection over time that may come as a complete shock to the average person. Is Warren Buffett An Optimist Or A Pessimist? Warren Buffet is indeed the wily Fox of Omaha. He made a prediction that seemed so wildly optimistic that it was shocking, and made newspaper headlines. And yet, he knew the whole time that is that it was an extremely safe projection, and far more conservative than most people would have any idea. Unless they took him up on his challenge to do the math. This is a case where Mr. Buffett is trying to have his cake and eat it too. If he wants to make a very safe prediction, then fine. But if he wants to genuinely back his words up about being profoundly optimistic then projecting Dow One Million simply doesn't cut it. He needs to be publicly predicting Dow Ten Million at the least, or preferably Dow Twelve Million or more. For if the future is indeed a mere Dow 1,000,000 in 100 years – then that is a downright pessimistic projection and the results would be quite poor for the average investor. By expanding on Mr. Buffett's challenge to "do the math" herein, I hope you have gained a better understanding about how very comfortable Warren Buffett was when he predicted that the Dow would go over One Million. Mr. Buffet's round number projection was also useful for helping to distinguish between the glittering surface and the underlying reality when it comes to long-term investment strategies. Media headlines routinely report record prices on almost everything - given enough time - when in many cases all they are really reporting is a record low purchasing power for the dollar. Getting ahead when all we are looking at is the glittering surface, and we are aided by the tail wind of what looks like ever more dollars (but is actually the destruction of the value of those dollars) - is one thing. Coming out ahead of both inflation and taxes is far, far more difficult, and indeed, can sometimes be more difficult than most people have any idea. But if what truly counts is what we can afford to buy in the future, after we have paid our taxes - then the cold reality of our after-inflation and after-tax returns is all that really matters, and the surface glittering returns of pre-tax and pre-inflation profits may not deliver nearly the wealth and the lifestyle that we hoped for. Disclaimer: This article contains the ideas and opinions of the author. It is a conceptual exploration of financial and general economic principles. As with any financial discussion of the future, there cannot be any absolute certainty. What this article does not contain is specific investment, legal, tax or any other form of professional advice. If specific advice is needed, it should be sought from an appropriate professional. Any liability, responsibility or warranty for the results of the application of principles contained in the article, website, readings, videos, DVDs, books and related materials, either directly or indirectly, are expressly disclaimed by the author.